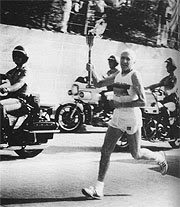 At Sunday School at the First Presbyterian Church of Hollywood, Lou Zamperini, the 1936 Olympic miler, came into the Two Year Olds' carrying the Olympic Torch he had carried as he ran with it for the 1984 Olympics here in Los Angeles. Lou is ninety two years old now, and a more vigorous ninety-year-old you will find it hard to meet. Although, ... if you read further back in my blog for September 2007 I have mentioned another. There is something truly remarkable about healthy seniors who still have a zest for life which all of us must envy. It says a lot for the human spirit that in our ranks we have individuals, like Lou, who in spite of great odds keep managing to fall on their feet no matter how adverse the circumstances they face. You have to read Mr. Zamperini’s book “Devil at My Heels” , with its foreword by Senator John McCane, to discover how the miracle of faith over adversity worked for him. In the book he tells the tale of surviving a plane crash into the Pacific Ocean, and drifting with his crew mates until they were captured by the Japanese, only to be interned in their prison camps. There Zamperini resisted psychological pressures to participate in propaganda broadcasts at great personal cost. Today I shook his had and held that Olympic Torch. At a time when many are watching the news from Beging it was delightful to have our own special connection with an athletic phenomenon.